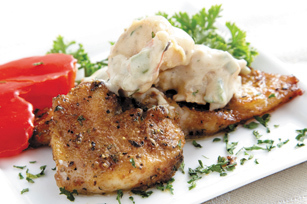 Serve Blackened Tilapia with shrimp and cream cheese sauce at your next meal! Garlic, pepper and a mix of other spices make Blackened Tilapia delicious. Combine lemon pepper seasoning, garlic powder, gumbo filé powder, and 1 tsp. each blackened seasoning, Cajun gumbo mix and ground red pepper. Rub seasoning mixture onto both sides of fish fillets. Melt 1/2 cup butter in large skillet on medium-high heat. Add tilapia to skillet; cook 3 min. on each side or until browned on both sides. Keep warm on low heat. Meanwhile, melt remaining butter in second large skillet on medium-high heat. Add cream cheese, mushrooms, soup, cream, onions and garlic; cook and stir gently 6 min. or until cream cheese is melted and mixture is blended. Add 1 tsp. parsley and remaining blackened seasoning, Cajun gumbo mix and ground red pepper to cream cheese sauce; mix well. Add shrimp; cook and stir 5 min. or until shrimp turn pink. Add mozzarella; cook and stir until mozzarella is melted and sauce is blended. Place tilapia on serving platter; top with cream cheese sauce. Garnish with remaining parsley. Use this homemade blackened seasoning blend to add restaurant flavor to your favorite meat or fish before cooking. Mix 3 Tbsp. paprika; 2 Tbsp. garlic powder; 2 Tbsp. onion powder; 2 tsp. black pepper; and 1 tsp. each dried basil, oregano, thyme and ground red pepper (cayenne) until blended. Store in resealable jar in cool dry cabinet.